In humans, loss of function mutations in the SAMHD1 (AGS5) gene cause a severe form of Aicardi-Goutières syndrome (AGS), an inherited inflammatory-mediated encephalopathy characterized by increased type I IFN activity and upregulation of IFN-stimulated genes (ISGs). In particular, SAMHD1-related AGS is associated with a distinctive cerebrovascular pathology that commonly leads to stroke. Although inflammatory responses are observed in immune cells cultured from Samhd1 null mouse models, these mice are physically healthy, specifically lacking a brain phenotype. We have investigated the use of zebrafish as an alternative system for generating a clinically relevant model of SAMHD1-related AGS. Using temporal gene knockdown of zebrafish samhd1, we observe hindbrain ventricular swelling and brain hemorrhage. Furthermore, loss of samhd1 or of another AGS-associated gene, adar, leads to a significant upregulation of innate immune-related genes and an increase in the number of cells expressing the zebrafish type I IFN ifnphi1. To our knowledge, this is the first example of an in vivo model of AGS that recapitulates features of both the innate immune and neurological characteristics of the disease. The phenotypes associated with loss of samhd1 and adar suggest a function of these genes in controlling innate immune processes conserved to zebrafish, thereby also contributing to our understanding of antiviral signaling in this model organism. Aicardi-Goutières syndrome (AGS) is a genetically determined inflammatory-mediated encephalopathy characterized by an upregulation of type I IFN activity and the increased expression of IFN-stimulated genes (ISGs) (1, 2). Mutations in seven genes are responsible for the AGS1-7 subtypes (3–7). A current hypothesis suggests a common role for these genes in the metabolism and signaling of endogenously derived nucleic acids. The SAMHD1 (AGS5) gene encodes a protein that has recently been shown to function as an HIV-1 restriction factor, capable of inhibiting early stage viral DNA synthesis by depleting the intracellular deoxyribonucleotide triphosphate pool (8, 9). It has been proposed that in SAMHD1-related AGS (AGS5), loss of SAMHD1 function leads to cytoplasmic accumulation of DNA derived from the reverse transcription of endogenous retroelements, which in turn induces an IFN response. Clinically, AGS5 differs from other AGS subtypes in that many patients demonstrate a distinct cerebral vasculopathy (10–13). Remarkably, this vascular phenotype can manifest as both stenotic (vessel narrowing, leading to a moyamoya appearance) and aneurysmal (vessel bulging) disease, which carry a high risk of intracerebral hemorrhage and stroke. The pathological basis of this phenotype is predicted, but not proven, to relate to a discrete role for SAMHD1 in blood vessel homeostasis via an innate immune-mediated mechanism. Recently, Samhd1 knockout mouse models have been generated (14, 15). Although cell and tissue-specific phenotypes associated with increased IFN signaling were observed, these mice were healthy and lacked any overt brain or cerebrovascular phenotype. Thus, there remains a requirement for a clinically relevant in vivo model of defective SAMHD1 activity. The use of zebrafish is emerging as a powerful tool to study the immune system (16). During the first 3 weeks of life, zebrafish exclusively demonstrate features of an innate (rather than adaptive) immune response. Therefore, during early development, innate immunity can be investigated in the absence of T and B cell activity (17). Characterization of the innate immune signaling repertoire in zebrafish is incomplete. However, it has been shown that antiviral responses in zebrafish demonstrate transcriptional overlap with those defined in mammals (18). Using a temporal gene knockdown approach, we have generated a zebrafish model of samhd1 deficiency. We observe cerebrovascular abnormalities that are associated with increased transcription of innate immune-responsive genes and an upregulation of ifnphi1, thereby apparently phenocopying AGS5. We propose that zebrafish may represent a novel in vivo system for studying the relationship between IFN signaling and a loss of SAMHD1 activity. Adult and larval zebrafish husbandry was approved by The University of Manchester Ethical Review Board and all experiments were performed in accordance with U.K. Home Office regulations. Embryos generated from a wild type (WT) AB zebrafish cross were used for morpholino (MO) characterization and gene expression analyses. Brain hemorrhage analyses were performed on embryos harvested from a double transgenic (fli1a:GFP)y1 / (gata1a:DsRed)sd2 adult zebrafish cross (19, 20), hereafter referred to as fli:GFP/gata1:DsRed. The (ifnphi1:mcherry)ip1 transgenic reporter line was used for ifnphi1 expression analyses (21). Fertilized embryos were collected and staged according to standard guidelines (22). Two MOs were designed and synthesized (Gene Tools, Philomath, OR) for inhibition of the samhd1 gene (samhd1 translation start codon [ATG], 5′-GCCGTTTAATCCGGTTCTCCATGGT-3′; samhd1 exon 4 splice donor, 5′-GCTCTCGGCTGTGAACGTACCCTAT-3′), as well as for the adar gene (adar ATG, 5′-AATTCCCTCCTCTACCTCTGCTCAT-3′; adar exon 4 splice donor, 5′-ACCTTGGAACGCATTTTACCGTGGA-3′). Fertilized embryos were injected with between 3.2 and 4.0 ng for both samhd1 MOs and 0.8 ng and 8.0 ng for the adar ATG and splice MO, respectively. The sequence and injection dosages for the cecr1 ATG MO have been published elsewhere (23). Standard control MOs provided by Gene Tools were also used. MO microinjection was performed as described previously (24). 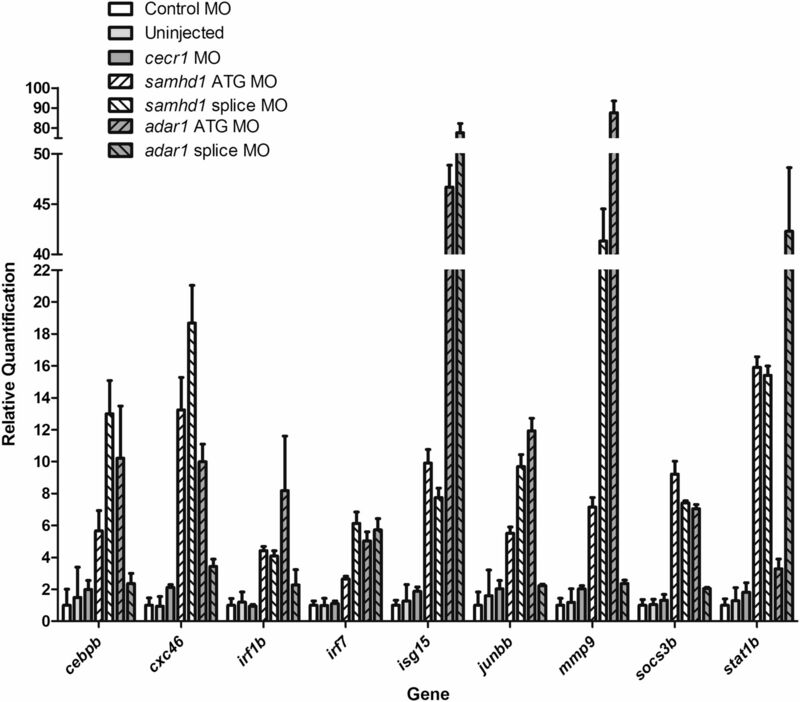 To assess efficiency of the splice MOs, total RNA was extracted as described previously (24). cDNA was synthesized from 400 ng RNA using the High Capacity RNA to cDNA Kit (Life Technologies). RT-PCR was performed using primers designed to flank exon 4 of the samhd1 cDNA transcript (forward: 5′-CCTGCTGTGTCTGACTGAGG-3′; reverse: 5′−CAAATCATGGCACAATCCAG-3′) to generate a WT amplicon of 394 bp; and primers designed to flank exon 4 of the adar cDNA transcript (forward: 5′-AGATGGTCGCAGGTTTCCAG-3′; reverse: 5′−CTCTTTCACAGCCTCCTCCG-3′) to generate a WT amplicon of 427 kb. For zebrafish protein lysates, embryos were pooled into groups of n = 40–60, dechorionated and deyolked (deyolking buffer: 55 mM NaCl, 1.8 mM KCl, 1.25 mM NaHCO3), and subsequently washed (postdeyolking wash buffer: 110 mM NaCl, 3.5 mM KCl, 2.7 mM CaCl2, 10 mM TrisHCl, pH 8.5). Embryos were then homogenized and lysed in EDTA plus RIPA buffer containing protease inhibitors (Roche). Whole-cell lysates from control and SAMHD1 null AGS5 patient (c.1-6085_c.208+2691del hom) (2) lymphoblastoid cell lines were prepared as described previously (7). Western blotting was performed as described previously (7) using an anti-human SAMHD1 polyclonal Ab (Abcam; ab67820). An anti-human total-p44/42 MAPK (ERK1/2) Ab was used as a loading control (Cell Signaling Technology; no. 9102). Full-length human SAMHD1 cDNA had been previously cloned into a pGEM-T easy vector (5). The expression cassette was excised using EcoR1 and subsequently ligated into pCS2+. In vitro transcription was performed using SP6 mMESSAGE mMACHINE (Life Technologies) following Not1 linearization. For the phenotypic rescue experiments, 100 pg of SAMHD1 mRNA was injected alone as a control, or in combination with the samhd1 ATG MO. Total RNA was extracted from n = 50–100 embryos at 4 d postfertilization (dpf) as described previously (24). cDNA was synthesized from 400 ng RNA using the High Capacity RNA to cDNA kit (Life Technologies). Quantitative real-time PCR (QRT-PCR) analysis was performed using the TaqMan Universal PCR Master Mix (Applied Biosystems). The relative abundance of target transcripts, measured using Taqman probes for cebpb (dr03201503_s1), cxc46 (custom design; see Supplemental Fig. 1), irf1b (dr03151900_g1), irf7 (dr03081134_g1), isg15 (custom design; see Supplemental Fig. 1), junbb (dr03203565_s1), mmp9 (dr03139883_g1), socs3b (dr03203997_s1) and stat1b (dr03151121_m1), was normalized to the expression of hprt1 (dr03095131_g1). Gene expression fold changes were calculated using Applied Biosystems StepOne Software V2.1 and Applied Biosystems Data Assist Software V3.01. Fold change values for each gene were plotted against each morphant group using GraphPad Prism version 5.0 and defined as the relative quantification (RQ). Column statistics were used to generate the median RQ values for each morphant group for the nine target genes pooled together (7). Morphant and control ifnphi1:mCherry transgenic embryos and nontransgenic embryos were harvested at 4 dpf (n = 40–60 embryos). Whole embryos were enzymatically dissociated using a 10 X Tryple (Life Technologies) and collagenase–dispase (Roche) mixture. Samples were incubated for 1 h at 28.5°C and triturated at regular intervals. Single-cell suspensions were analyzed using a BD Biosciences LSRFortessa cell analyzer running Diva 8.1 software. The samples were gated using FS-H Vs FS-A (forward scatter height versus forward scatter area) to select single cells and then on forward scatter versus side scatter to exclude debris. mCherry was excited using a 561-nm laser and the fluorescence measured using a 610/20-nm bandpass filter. Autofluorescence was determined using cells obtained from nontransgenic embryos using 488-nm excitation and measured using a 530/30-nm bandpass filter. The numbers of mCherry-positive cells were isolated by drawing a region on a two-parameter plot of mCherry versus autofluorescence just above the level of the autofluorescence. The number of mCherry-positive events was counted from 200,000 cells for each group. Experiments were performed in triplicate. The number of mCherry-positive cells was normalized to the uninjected group and the mean relative quantification was plotted. Statistical differences were evaluated using one-way ANOVA with the Newman–Keuls multiple comparison test. Statistics were calculated using GraphPad Prism version 5.0 software. AGS5 is caused by loss-of-function mutations in the SAMHD1 gene (5). As mutant Samhd1 mice lack any overt physical phenotype (14, 15), we sought to investigate the use of zebrafish embryos as a possible alternative vertebrate disease model. A single samhd1 ortholog (ENSDARG00000071288) can be identified in the zebrafish reference genome (zv9, www.ensembl.org). Zebrafish samhd1 protein (accession number NP_001153405, http://www.ncbi.nlm.nih.gov/protein/) is relatively well conserved, sharing 60% homology with the human ortholog (Supplemental Fig. 2). We performed samhd1 gene knockdown experiments in WT zebrafish embryos using an antisense MO strategy. We designed an MO to specifically target the translation start codon (ATG) of the zebrafish samhd1 transcript, which was predicted to inhibit protein synthesis. Using an anti-human SAMHD1 Ab, Western blot analyses confirmed a reduction in samhd1 protein expression in morphants in comparison with controls (Fig. 1A), thereby providing us with confidence that the MO was specifically limiting samhd1 translation in vivo. We next monitored the effects of loss of samhd1 during larval development. Following samhd1 knockdown, we observed a mild developmental delay that we perceived to relate possibly to a nonspecific MO effect (25). However, we also observed swelling within the fourth ventricle of the brain between 2 and 3 dpf, a phenotype not normally reported with the use of MO technology. To account for variation in the severity of this phenotype, we classified swellings into four categories: normal, mild, moderate, and severe (Fig. 1B). Embryos were scored in n = 80–120 morphants and the same number of controls at 3 dpf; 94% of samhd1 morphants displayed a severe (50% of total) or moderate (44% of total) swelling phenotype (Fig. 1C). To confirm whether this could be specifically attributed to loss of samhd1, we next coinjected human WT SAMHD1 mRNA with the samhd1 ATG MO. Although, a generic developmental delay phenotype was retained, we recorded that only 2% of the coinjected embryos now exhibited severe swellings, whereas 24% and 49% displayed moderate and mild phenotypes, respectively (Fig. 1C). These rescue data suggest that the ventricular swelling observed is a direct result of specific knockdown of the samhd1 gene. Specific knockdown of zebrafish samhd1 is associated with hindbrain ventricular swelling. (A) Western blot analysis reveals a reduction in samhd1 protein level in samhd1 ATG (lane 5) morphants in comparison with uninjected (lane 3) and control MO (lane 4) embryos (n = 40–60 embryos per group). WT human (lane 1) and SAMHD1-null AGS5 patient (lane 2) lymphoblastoid cell line lysates were also loaded as a specificity control for the anti-human SAMHD1 Ab. An anti-ERK Ab was used as a loading control. (B) Four levels of severity were categorized based on the hindbrain (fourth ventricle) swelling (arrow) phenotype observed between 2 and 3 dpf: normal, mild, moderate, and severe. Original magnification ×32. (C) Almost 100% of control embryos (uninjected and RNA only [100 pg] groups) exhibited normal brain development. Conversely, ∼45% and 50% of embryos demonstrated moderate and severe brain swelling phenotypes when injected with the samhd1 ATG MO (ATG 400 μM). The severity of this phenotype was reduced considerably when the samhd1 ATG MO was coinjected with human SAMHD1 RNA (ATG 400 μM plus RNA 100 pg; n = 40–80 embryos per group, repeated three times). To gain insight into the cause of the cerebral swelling seen in samhd1-MO treated embryos, and considering the observation of a cerebral vasculopathy in patients with SAMHD1 mutations (10–13), we next wanted to test whether there was any evidence that samhd1 knockdown was associated with brain hemorrhage. We injected samhd1 ATG MO into embryos derived from crossing a double transgenic fli1:GFP/gata1:DsRed reporter zebrafish line (19, 20). In these double-transgenic embryos, endothelial cells express GFP and erythrocytes express DsRed, allowing us to monitor the status of blood circulation by fluorescence stereomicroscopic examination of live animals. As a positive control, we examined cecr1 morphants, because mutations in the CECR1 gene cause an early-onset vasculopathy and knockdown of the zebrafish homolog is associated with brain hemorrhage (23). Embryos were quantified in six independent experiments for the presence or absence of blood pools within brain or head regions between 2 and 3 dpf (Fig. 2A). Knockdown of cecr1 caused brain hemorrhage in 55.9% of injected embryos. Hemorrhages were observed in a comparable proportion of samhd1 morphant embryos (46.7%), significantly higher in comparison with either uninjected (16.3%) or control morphant (20.3%) embryos (Fig. 2B). 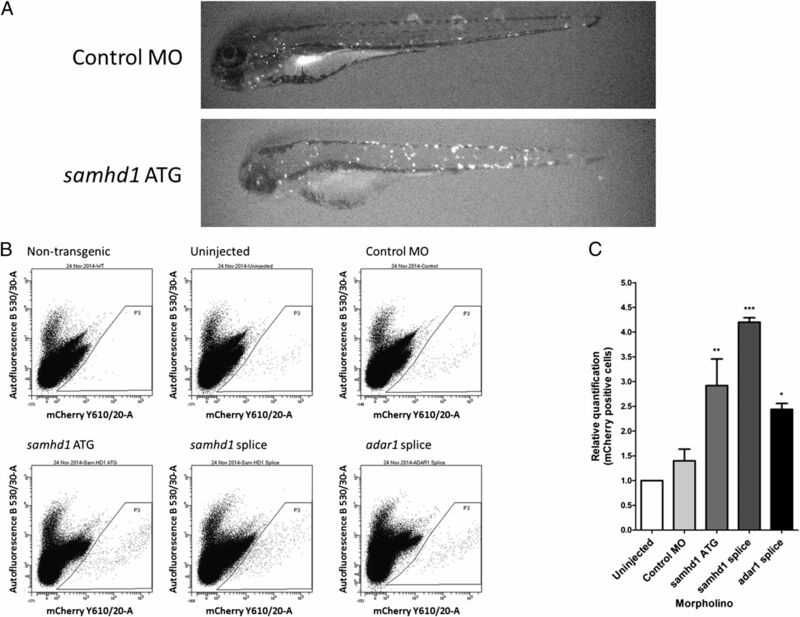 Thus, samhd1 knockdown results in brain bleeding in zebrafish. samhd1 knockdown is associated with a brain hemorrhage phenotype in a proportion of morphants. (A) Examples of brain hemorrhage phenotypes in embryos (aged between 2 and 3 dpf) derived from a transgenic fli1:GFP/gata1:DsRed reporter zebrafish line. Embryos were scored as negative (left panel) or positive (right panel) for bleeding depending on the absence or presence of blood pooling (red fluorescent signal) within the head–brain regions, respectively. Original magnification ×50. (B) The proportion of embryos exhibiting brain hemorrhages was quantified for groups of embryos injected with cecr1 or samhd1 ATG MO in comparison with uninjected and control morphants. Brain hemorrhage was observed in a significantly higher proportion of cecr1 (55.9%) and samhd1 (46.7%) morphants, in comparison with uninjected (16.3%) and control morphants (20.3%; n = 30–80 embryos per group, repeated six times). (C) The percentage of hindbrain swellings was quantified in uninjected, control MO, cecr1, and samhd1 ATG morphant embryos at 2 dpf. A significantly greater proportion of embryos exhibiting swellings were observed in the samhd1 morphant group in comparison with any other group (n = 80–120 embryos per group, repeated three times). *p < 0.05 using one-way ANOVA with Newman–Keuls multiple comparison test. In addition, hindbrain swellings were quantified in triplicate experiments in samhd1, cecr1, control MO, and uninjected embryos at 2 dpf (Fig. 2C). Although a higher proportion of embryos displaying swellings were observed in cecr1 (11.7% ± 2.8; mean ± SEM) morphants in comparison with the control MO group (1.2% ± 0.5), this difference was not significant. In contrast, the proportion of embryos exhibiting swellings was significantly higher in the samhd1 morphant group (68.8% ± 7.7) compared with all other groups. This result suggests that the hindbrain swelling that we observed was specific for loss of samhd1, and not secondary to the disruption of cerebral vasculature. Biochemically, AGS is characterized by a significant increase in ISG expression in peripheral blood (2). Recently, a transcriptional response has been described for larval zebrafish in response to infection from two different viruses (18). Although the repertoire of upregulated genes was distinct in response to the two infections, a degree of genetic overlap was shown to exist between both models. To assess whether the phenotype that we observed on knockdown of samhd1 might be associated with increased transcription of innate immune-related genes, we measured the expression levels of a number of genes considered to play a role in antiviral, innate immune mechanisms in our samhd1 morphant model. We established a panel of nine genes based on a combination of 1) preliminary samhd1 morphant microarray data (data not shown), 2) genes described as upregulated in zebrafish models of viral infection (18), and 3) ISGs defined as overexpressed in the context of human AGS (2). We performed Taqman QRT-PCR using specific probes designed to target each of these genes on cDNA synthesized from RNA that we harvested from n = 50–100 larvae per group at 4 dpf. We observed a significant increase in the expression of these genes in the samhd1 ATG morphants (median RQ = 7.15; interquartile range (IQR) = 4.97–11.57) in comparison with cecr1 morphants (median RQ = 1.88; IQR = 1.22–2.03), uninjected embryos (median RQ = 1.20; IQR = 1.02–1.39), and control morphants (median RQ = 1; baseline reference; Fig. 3). To confirm this result, we also used a second MO that targets the splice donor site at the intron–exon boundary of exon 4 of samhd1 premRNA (Supplemental Fig. 3A), and we observed a significant increase in the expression of our gene panel (median RQ = 9.7; IQR = 6.77–17.05) in comparison with cecr1 morphants and uninjected and control morphant embryos (Fig. 3). Taqman QRT-PCR was performed on cDNA synthesized from total RNA harvested from uninjected, control MO, cecr1, samhd1 ATG, samhd1 splice, and adar ATG and adar splice morphant embryos (n = 50–100 per group). The relative abundance (RQ) of target transcripts cebpb, cxc46, irf1b, irf7, isg15, junbb, mmp9, socs3b, and stat1b was normalized to the expression of the housekeeping gene hprt1. Each PCR was performed three times in triplicate per cDNA sample (total of nine technical repeats per sample). Biological repeats were also performed showing comparable differences (data not shown). A significant increase in expression of the nine genes was observed when comparing both samhd1 ATG and splice morphants to controls and when comparing adar ATG morphants to controls, p < 0.05 using one-way ANOVA with Newman–Keuls multiple comparison test. Characterization of genes that can be considered as bona fide antiviral “signature” genes has not been studied in zebrafish as extensively as in humans (26). Indeed, stimulus-dependent variations in the innate immune transcriptional response exist in zebrafish (18). As the panel of genes that we used was selected based on criteria relating to categories 1–3 described above, we next wanted to test the validity of this result using an alternative zebrafish model of disturbed innate immunity. Hypomorphic mutations in the ADAR gene cause AGS6, and they are associated with a substantial upregulation of ISG expression (7). Mice lacking the Adar gene die in utero and similarly demonstrate a marked overexpression of ISGs (27, 28). According to the current version of the zebrafish reference genome (zv9), zebrafish have a unique adar ortholog (ENSDARG00000012389), previously identified (29) but not studied functionally. Using ATG and splice-blocking (exon 4) MOs to target adar, we observed a severe developmental phenotype even at low concentrations of the ATG MO. Conversely, adar splice morphants appeared morphologically normal at high MO concentrations, although it targets an exon used in all known splice variants of adar. RT-PCR of adar splice morphant cDNA, using primers that flank exon 4, confirmed aberrant splicing of the adar transcript (Supplemental Fig. 3B). RNA was harvested from n = 50–100 adar morphant embryos, and cDNA was synthesized before performing Taqman QRT-PCR using the probe set described above. We observed a significant increase in the expression of the innate immune genes included in our panel in adar ATG morphants (median RQ = 9.99; IQR = 6.04–29.31) in comparison with cecr1 morphants and uninjected and control morphant embryos (Fig. 3). Overall, gene expression was not significantly altered in the adar splice morphants (median RQ = 2.37; IQR = 2.25–24.01) in comparison with controls, although expression of three of the nine genes was upregulated (irf7, isg15, and stat1b), suggesting that these embryos display a degree of innate immune gene activation, albeit milder in comparison with the adar ATG and the samhd1 morphants. As well as a significant enhancement of ISG transcription, AGS is characterized molecularly by increased IFN-α activity in patient cerebrospinal fluid and serum (1, 2). In zebrafish, four type I IFNs are expressed (IFN-φ 1–4). However, only IFN-φ1 and IFN-φ3 are functional during larval development (30). We took advantage of the transgenic ifnphi1:mCherry reporter line, embryos of which exhibit increased expression of mCherry in a subset of cells following viral infection, reflecting endogenous ifnphi1 expression (21). To determine whether the increase in expression of our putative immune gene panel in the samhd1 morphants was also associated with upregulation of ifnphi1 itself, we performed samhd1 knockdown experiments in zebrafish embryos harvested from the transgenic ifnphi1:mCherry reporter line. At 4 dpf, morphant embryos were analyzed by fluorescent microscopy and subsequently processed for flow cytometry and quantification of mCherry-positive cells. We observed significant increases in the number of mCherry-positive cells in both samhd1 ATG (RQ = 2.92 ± 0.5; mean ± SEM) and samhd1 splice morphants (RQ = 4.20 ± 0.1) in comparison with control morphants (RQ = 1.40 ± 0.2) and uninjected larvae (median RQ = 1; baseline reference; Fig. 4). Furthermore, we also recorded a significant increase in mCherry-positive cells in adar splice morphants (RQ = 2.44 ± 0.1), suggesting an increase in innate immune gene expression with upregulation of ifnɸ1 in both models. Inhibition of the samhd1 gene is associated with an increase in ifnphi1 expression. (A) Example of the enhanced numbers of mCherry-positive cells distributed throughout the body in ifnphi1:mCherry transgenic embryos injected with samhd1 MO (lower panel) in comparison with controls (upper panel). Original magnification ×32. (B) Representative two-parameter scatter plots of mCherry-positive cells analyzed from single-cell suspensions generated from ifnphi1:mCherry embryos from uninjected, control MO, samhd1 ATG, samhd1 splice, and adar splice morphant groups. (C) A significant increase in the relative number of ifnphi1-expressing cells was observed in samhd1 and adar morphants in comparison with controls following flow cytometry quantification of mCherry-positive cells. The number of mCherry-positive cells counted from P3 was normalized to the uninjected group for each run, and the mean relative quantification was plotted (n = 40–60 embryos per group, repeated three times). *p < 0.05, **p < 0.01, ***p < 0.001 using one-way ANOVA with Newman–Keuls multiple comparison test. Mice deficient in the genes associated with AGS1-7 exist. However, the suitability of these models to study the inflammatory and neurological aspects of AGS is restricted, either because of a lack of brain phenotype—such as Trex1 (31–33), Samhd1 (14, 15), or Ifih1 (34)—or because of embryonic lethality—such as Rnaseh2 (35, 36) and Adar (27, 28). To develop treatments for AGS patients, it is desirable to generate an animal model that reliably recapitulates the neurological characteristic aspects of the disease. In this study, we describe a novel in vivo model of AGS demonstrating, to our knowledge for the first time, inflammatory and brain phenotypes that may be relevant to the human condition. Following knockdown of the samhd1 gene in zebrafish embryos, we observed hindbrain ventricular swellings and hemorrhages in the brain. In addition to the severe brain damage, likely occurring secondary to a microangiopathic process, which is common to all forms of AGS, SAMHD1 mutations also result in an apparently gene-specific cerebral vasculopathic phenotype frequently leading to intracerebral hemorrhage during early life (10–13). As with all subtypes of the disorder, AGS5 is associated with a significant upregulation of ISGs (2). Likewise, increased expression of ISGs was observed in spleen, fibroblasts, and macrophages harvested from mice lacking the Samhd1 gene (14, 15). However, these mice did not display any detectable brain, or any other, phenotype. Our data imply that zebrafish might be a better model for studying AGS5-related cerebrovascular defects, either because zebrafish samhd1 shares a greater degree of functionality with the human ortholog in comparison with the mouse protein, or, because of some form of compensatory genetic mechanism in mice, which is absent in zebrafish. Such conclusions are speculative at this point, in part because of differences between the models regarding transient gene knockdown versus germline mutation. Loss of cecr1 in zebrafish is associated with a brain hemorrhage phenotype (23). In contrast to samhd1 knockdown, however, we did not detect hindbrain ventricular swellings in this model. Brain hemorrhages and hindbrain ventricular swelling have been recorded together as a result of endothelial defects in zebrafish models of pak2a deficiency (37, 38). Further study is required to determine the cellular processes associated with the features seen in our samhd1 morphants. The ISG response in humans is characterized by differences in the gene transcriptional profile induced according to the viral stimulus involved (26). The ISG innate immune transcriptional response to different viral stimulation in zebrafish is yet to be fully defined, although it is apparent that overlap exists with the human state (18). Of note, as in humans, it appears that the transcriptional response in fish is stimulus dependent (18, 30, 39). Against this background, we selected a panel of transcripts that might be relevant to a putative innate immune response as observed in humans secondary to AGS-related protein loss. Using data obtained from a preliminary microarray expression analysis, in combination with knowledge of genes significantly upregulated in zebrafish models of viral infection (18) and in human AGS (2), we compiled a panel of innate immune genes to test in our zebrafish model. We observed significantly enhanced expression of these genes using two samhd1-targeting strategies. In addition, we recorded upregulation of these transcripts in adar morphants (AGS6), which we performed to validate the selection of the genes in our panel. 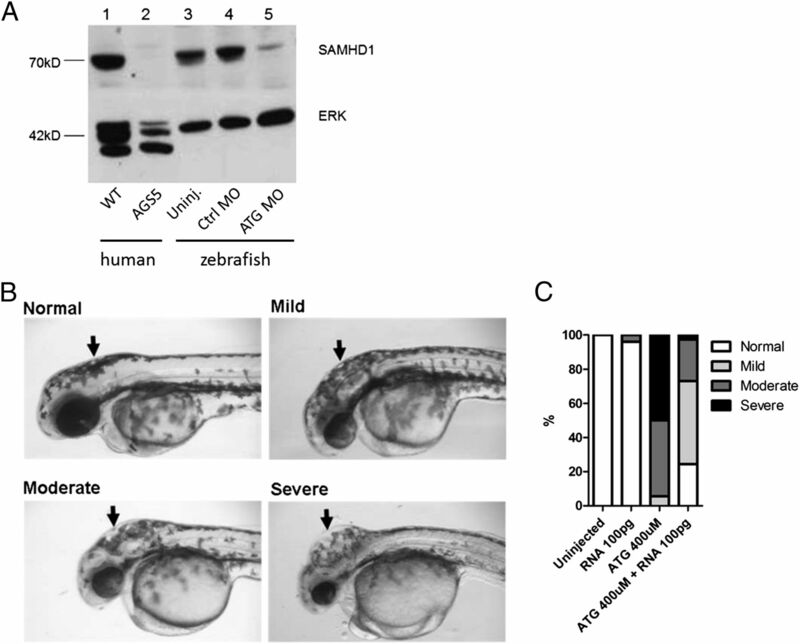 Taken together, these data suggest that, as for mammals, samhd1 and adar possess functions that involve regulation of innate immune responses in zebrafish. The gene, isg15, was highlighted as significantly upregulated in our preliminary studies and subsequently confirmed following QRT-PCR. In humans, ISG15 dysregulation is associated with neuroinflammatory disease (2, 40). Zebrafish isg15 is also activated after viral stimulation (18), and it has been shown to be a key regulator of IFN-mediated antiviral responses (41). In addition, we observed upregulation of mmp9 and junbb, both of which are induced in zebrafish viral infection models (18). Functional knowledge of the zebrafish specific chemokine cxc46 is relatively poor. 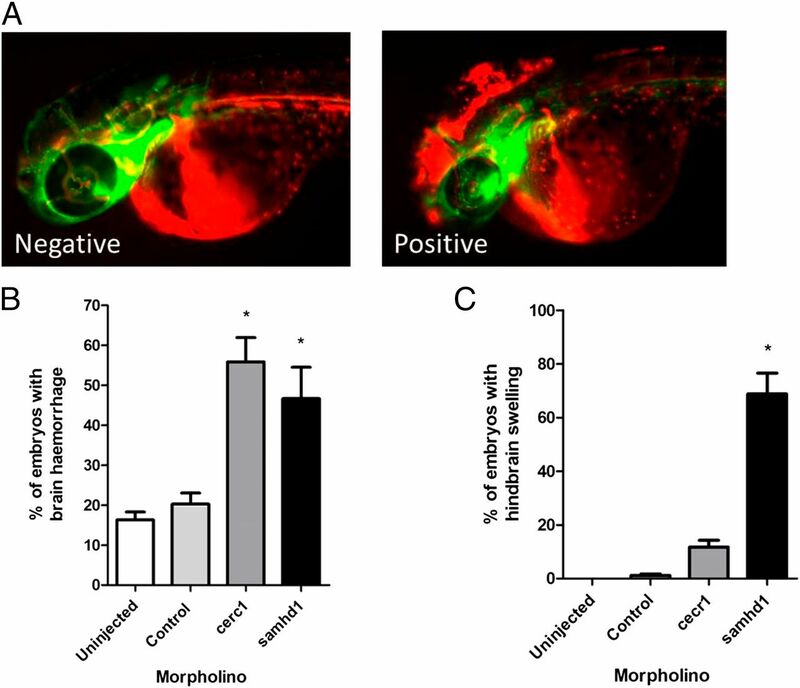 However, other CXC chemokine family members are upregulated in response to viral infection in zebrafish larvae (18), and increased expression of chemokines has been reported in AGS (42, 43). Increased expression of genes encoding the transcription factors irf1b, irf7, stat1b, and cebpb, as observed in our morphants, has also been recorded following exposure to two viruses in zebrafish infection models (18), and significant upregulation of the human orthologs, STAT1 and IRF7 is seen in AGS (7). Although not implicated in AGS or zebrafish viral infection models, we deemed the socs3b gene worthy of further examination because of the known inflammatory-related functions of the suppressors of cytokines (SOCS) proteins, and the observation of increased socs3 expression in carp following infection with Spring viremia of carp virus (39). Importantly, consistent with an upregulation of ISGs and innate immune genes, we were also able to demonstrate increased expression of the zebrafish type I IFN, ifnphi1, following knockdown of samhd1 and adar. In conclusion, we have observed that the loss of samhd1 in zebrafish is associated with features reminiscent of the cerebral hemorrhage phenotype in AGS5, and that both samhd1 and adar zebrafish knockdown recapitulate the IFN response seen in AGS. Even taking into account concerns over the use of MO technology in zebrafish (25), our data indicate that the analysis of stable mutants of samhd1 and adar in zebrafish is warranted to shed light on the nature of the innate immune stimulus in these disease states, and to extend our knowledge of antiviral responses in zebrafish more generally. We thank Dr. Adam Hurlstone and Dr. Shane Herbert for sharing zebrafish strains and equipment and Mike Jackson at the University of Manchester Flow Cytometry Facility for technical support. This work was supported by the Newlife Foundation, the Natalie Kate Moss Trust, the European Research Council (GA 309449: fellowship to Y.J.C. ), and state subsidies managed by the National Research Agency (France) under the “Investments for the Future” program bearing the reference ANR-10-IAHU-01 and the “Zebraflam” program bearing the reference ANR-10-MIDI-009.
. 2006. Mutations in genes encoding ribonuclease H2 subunits cause Aicardi-Goutières syndrome and mimic congenital viral brain infection. Nat. Genet. 38: 910–916.
. 2009. Mutations involved in Aicardi-Goutières syndrome implicate SAMHD1 as regulator of the innate immune response. Nat. Genet. 41: 829–832.
. 2014. Gain-of-function mutations in IFIH1 cause a spectrum of human disease phenotypes associated with upregulated type I interferon signaling. Nat. Genet. 46: 503–509.
. 2012. Mutations in ADAR1 cause Aicardi-Goutières syndrome associated with a type I interferon signature. Nat. Genet. 44: 1243–1248.
. 2011. HIV-1 restriction factor SAMHD1 is a deoxynucleoside triphosphate triphosphohydrolase. Nature 480: 379–382.
. 2012. SAMHD1 restricts the replication of human immunodeficiency virus type 1 by depleting the intracellular pool of deoxynucleoside triphosphates. Nat. Immunol. 13: 223–228.
. 2011. Cerebral vasculopathy is a common feature in Aicardi-Goutieres syndrome associated with SAMHD1 mutations. Proc. Natl. Acad. Sci. USA 108: E232, author reply E233.
. 2010. Intracerebral large artery disease in Aicardi-Goutières syndrome implicates SAMHD1 in vascular homeostasis. Dev. Med. Child Neurol. 52: 725–732.
. 2010. Cerebral arterial stenoses and stroke: novel features of Aicardi-Goutières syndrome caused by the Arg164X mutation in SAMHD1 are associated with altered cytokine expression. Hum. Mutat. 31: E1836–E1850.
. 2011. Homozygous mutation in SAMHD1 gene causes cerebral vasculopathy and early onset stroke. Proc. Natl. Acad. Sci. USA 108: 5372–5377.
. 2013. Mouse SAMHD1 has antiretroviral activity and suppresses a spontaneous cell-intrinsic antiviral response. Cell Reports 4: 689–696.
. 2013. SAMHD1-dependent retroviral control and escape in mice. EMBO J. 32: 2454–2462.
. 2012. A model 450 million years in the making: zebrafish and vertebrate immunity. Dis. Model. Mech. 5: 38–47.
. 2012. Pathogen recognition and activation of the innate immune response in zebrafish. Adv. Hematol. 2012: 159807.
. 2014. Contrasted innate responses to two viruses in zebrafish: insights into the ancestral repertoire of vertebrate IFN-stimulated genes. J. Immunol. 192: 4328–4341.
. 2002. In vivo imaging of embryonic vascular development using transgenic zebrafish. Dev. Biol. 248: 307–318.
. 2003. Transplantation and in vivo imaging of multilineage engraftment in zebrafish bloodless mutants. Nat. Immunol. 4: 1238–1246.
. 2013. Real-time whole-body visualization of Chikungunya Virus infection and host interferon response in zebrafish. PLoS Pathog. 9: e1003619.
. 1995. Stages of embryonic development of the zebrafish. Dev. Dyn. 203: 253–310.
. 2014. Early-onset stroke and vasculopathy associated with mutations in ADA2. N. Engl. J. Med. 370: 911–920.
. 2011. Impairment of the tRNA-splicing endonuclease subunit 54 (tsen54) gene causes neurological abnormalities and larval death in zebrafish models of pontocerebellar hypoplasia. Hum. Mol. Genet. 20: 1574–1584.
. 2014. Out with the old, in with the new: reassessing morpholino knockdowns in light of genome editing technology. Development 141: 3103–3104.
. 2011. A diverse range of gene products are effectors of the type I interferon antiviral response. Nature 472: 481–485.
. 2009. ADAR1 is essential for the maintenance of hematopoiesis and suppression of interferon signaling. Nat. Immunol. 10: 109–115.
. 2014. The RNA-editing enzyme ADAR1 controls innate immune responses to RNA. Cell Reports 9: 1482–1494.
. 2000. Comparative analysis of the DRADA A-to-I RNA editing gene from mammals, pufferfish and zebrafish. Gene 250: 53–60.
. 2013. The antiviral innate immune response in fish: evolution and conservation of the IFN system. J. Mol. Biol. 425: 4904–4920.
. 2004. Gene-targeted mice lacking the Trex1 (DNase III) 3′—>5′ DNA exonuclease develop inflammatory myocarditis. Mol. Cell. Biol. 24: 6719–6727.
. 2014. Autoimmune disorders associated with gain of function of the intracellular sensor MDA5. Immunity 40: 199–212.
. 2012. Mammalian RNase H2 removes ribonucleotides from DNA to maintain genome integrity. J. Exp. Med. 209: 1419–1426.
. 2012. Enzymatic removal of ribonucleotides from DNA is essential for mammalian genome integrity and development. Cell 149: 1008–1022.
. 2007. pak2a mutations cause cerebral hemorrhage in redhead zebrafish. Proc. Natl. Acad. Sci. USA 104: 13996–14001.
. 2007. A betaPix Pak2a signaling pathway regulates cerebral vascular stability in zebrafish. Proc. Natl. Acad. Sci. USA 104: 13990–13995.
. 2010. Cloning of common carp SOCS-3 gene and its expression during embryogenesis, GH-transgene and viral infection. Fish Shellfish Immunol. 28: 362–371.
. 2013. Zebrafish ISG15 exerts a strong antiviral activity against RNA and DNA viruses and regulates the interferon response. J. Virol. 87: 10025–10036.
. 2013. Elevation of proinflammatory cytokines in patients with Aicardi-Goutières syndrome. Neurology 80: 997–1002.
. 2008. Astrocytes produce interferon-alpha and CXCL10, but not IL-6 or CXCL8, in Aicardi-Goutières syndrome. Glia 56: 568–578.